How to Brew Kefir Water? So, what is water kefir? It’s actually quite simple! Water kefir is much like kombucha in the sense that it is first cultured by bringing a SCOBY into the mix. SCOBY stands for symbiotic culture of bacteria and yeasts, and mixing it with sugar water. The SCOBY metabolizes the sugar and turns it into an array of acids that are great for helping microorganisms grow. Water kefir grains are small, translucent, gelatinous structures that almost look like little crystals. When they are correctly taken care of, they create a fantastic probiotic beverage that will continue to grow and reproduce with very little work on your end! Just like most fermented foods, water kefir goes a long way in terms of supporting gut health and systemic wellness. The beneficial bacteria create a variety of beneficial acids, food enzymes, B vitamins, and more. When it comes to probiotics in general, they are incredibly beneficial when it comes to a lot of aspects of your dietary system and beyond. Consuming probiotics can help with digestive issues such as diarrhea, bloating, and gas. It can also help your body better and more efficiently absorb the nutrients in your food. Probiotics can help improve acne and skin health, and can even help with mental health. In fact, probiotics are now being seen as a possible additional way to help combat anxiety and depression. Is there alcohol is water kefir? Just like all other fermented beverages, water kefir produces a small amount of alcohol. Typically the alcohol content in water kefir is around .5 to .75 percent. To put that into perspective, a typical light beer has an alcohol content level around 5 percent to 7 percent. Water kefir is practically alcohol free, but if you are worried about the level of alcohol in your water kefir, you can test it with a hydrometer. How can I make my own water kefir? The answer to this question is quite straight forward, but there are a few steps that you are going to want to keep in mind when you start working to make your very own water kefir. 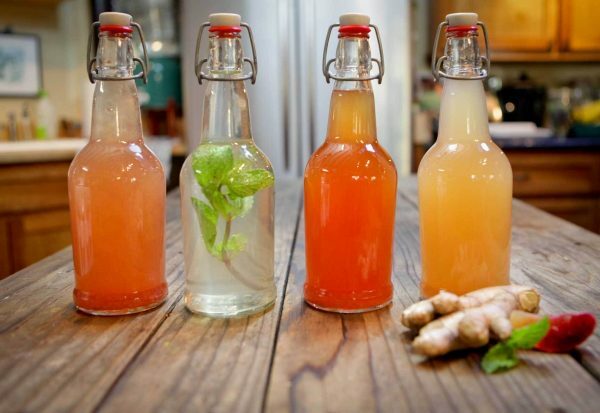 The first thing you are going to want to make water kefir is your own SCOBY. That’s the colony of bacteria that will quickly begin to grow and reproduce. One important thing to keep in mind is that water kefir grains should no be made with milk kefir grains. That is a different composition of bacteria and – unsurprisingly – needs milk to grow. When you are trying to decide what water to begin culturing your grains in, consider the fact that water kefir grains proliferate best in a high-mineral environment. That means that you’ll have to add some type of sugar to the mix so that they can feed and grow. Using cane sugar is fine, but mineral-rich unrefined sugars potentially work best. Another mineral that works is Concentrace. It’s a liquid mineral supplement, and certainly promotes bacteria growth in your water kefir. The next thing you’ll want to keep in mind is the equipment you’ll need to brew your own water kefir. In order to do so, you’ll need a jar with either a loose-fitting lid or a square of cheesecloth. If you want to increase the fizziness of your drink (this might be recommended, definitely adds to the crispness), you may want to consider cap beer bottles that seal in all the carbonation. One thing to be sure when doing this is to make sure that you are using fermentation grade bottles, because if you do not the air pressure within the bottle could result in a loud bang and a very big mess. 1/2 cup of fruit juice or 2 tablespoons of organic cane sugar. Bring six cups of unfiltered water to a boil, stir in the sugar until it dissolves. Allow to cool to water temperature. Place the water kefir grains into a two-quart jar, pour in the sugar water and drop in the figs and lemon. Put your liquid into mason jar and close with lid or cover with cheesecloth. Allow to ferment for 2 to 3 days. Following the fermentation period, strain it through either a plastic, wood, or stainless steel strainer into a pitcher. Throw away the lemon and fig, but keep the grains if you’d like to immediately use them for more. They can be stored in the fridge for up to 1 week. While kefir water can be enjoyed plain, you can also put it through a second fermentation process. This allows you to flavor the drink how you see fit. This takes place in the cap beer bottles with additional fruit juice. Not only will the juice enhance the flavor, the sugar within the juice will help feed the microbes in your probiotic even further adding to a crisp drink. For your secondary fermentation, pour your juice into the flip-top bottle and make sure that you are filling your bottle within 1/2-inch to 1 inch of their opening. Seal the bottles and set them upon your countertop to ferment from 18 to 24 hours. After the fermentation process, transfer your drink to the fridge for 3 days to allow the bubbles to set. When it is finally time to open, make sure to do so over the sink as the pressurized liquid may fizz and foam. Now that you know how to make your very own, it’s time to get out there and get to making your favorite new probiotic drink!